According to experts, anxiety develops from the combination of three ingredients: genetic traits (such as “biological sensitivity”), family influences, and stress (the “why now” factor). The stress ingredient accounts for the widespread prevalence of anxiety today. Translation? Anxiety is essentially a learned response to stress overload in sensitive people. 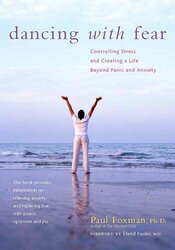 Based on the author’s years of experience with anxiety, both personally and professionally as a seasoned psychologist, Dancing with Fear uses a recovery approach to treating this widespread problem. Dr. Foxman offers a wide range of self-help strategies — from drugs and diet to herbs and yoga — for combating panic attacks, phobias, avoidant behavior, worrying, unwanted obsessions, and body symptoms such as racing heart, shaking, breathing problems, sweating, nausea, and weakness. With 20 percent new material in this edition, Dancing with Fear offers a proven plan for reclaiming one’s life by replacing anxiety with peace, optimism, and joy. Dr. Paul Foxman is Founder and Director of the Center for Anxiety Disorders in Burlington, Vermont. He has over 40 years of professional experience in a variety of settings, including schools, community mental health centers, graduate psychology programs and private practice. Dr. Foxman is the author of Dancing With Fear (2007) and The Worried Child (2004), as well as other publications on the topic of anxiety including a co-authored casebook, Conquering Panic and Anxiety Disorders (2003). His newest book, The Clinician’s Guide to Anxiety in Kids and Teens, will be released in 2016. Dr. Foxman travels internationally to speak on the topic of anxiety, and he has appeared as an expert on radio and television.